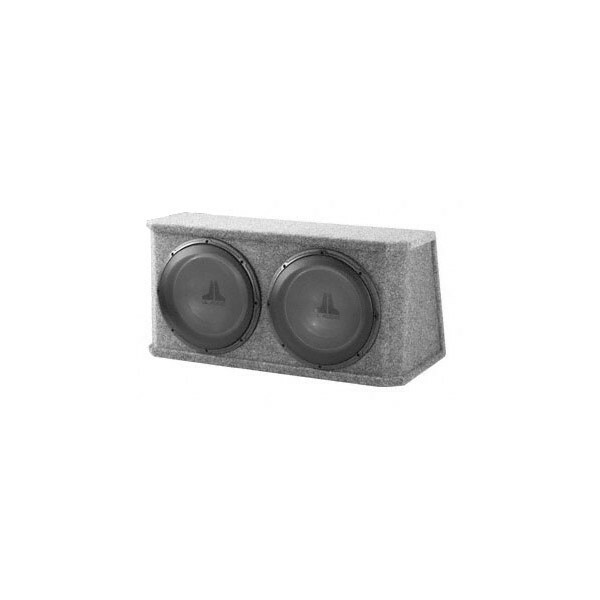 JL Audio PowerWedge enclosed subwoofer systems deliver thunderous bass without needing a lot of power. Each enclosure is designed from the ground up to get optimum performance from its drivers, so you get much more than just a box with a speaker inside. JL Audio uses state-of-the-art automated woodworking equipment to fabricate high-quality MDF enclosures with rugged automotive carpeting, steel-mesh grilles, 5-way binding posts, and solid internal wiring. The enclosures are finished and inspected by hand at the manufacturing facility in Florida to ensure that you get the bass that you expect from JL Audio. The hatchback-style JL Audio CS213RG-W1v2-2 Sealed PowerWedge handles up to 700 watts RMS, housing a pair of high-performance 13.5" W1v2 subwoofers that pound out righteous low end. Each sub sits in its own individual chamber while the enclosure offers a single wiring terminal. The airtight sealed design allows the subs to deliver powerful, accurate bass without hogging up all your storage space. You'll hear more punch and impact from all of your music with this capable enclosure in your trunk or cargo area.